Ulysses G. J. Balis, M.D., has been appointed to the Database and Information Technology Advisory Committee, or DITAC, of the American Board of Medical Specialties, or ABMS. The DITAC provides oversight and guidance on policies and procedures related to the ABMS database and information technology. Balis is a professor of pathology and directs both the Division of Pathology Informatics and the Pathology Informatics Fellowship Program. Eva L. Feldman (Ph.D. 1979, M.D. 1983, Fellowship 1988), director of the Program for Neurology Research and Discovery, was honored as one of America’s top doctors at the 11th Annual National Physician of the Year Awards. The awards annually recognize and honor exemplary physicians practicing in communities throughout the United States. Feldman, also the Russell N. DeJong Professor of Neurology and director of the A. Alfred Taubman Medical Research Institute, was one of three recipients of the Clinical Excellence Award. Anna S. Lok, M.D., the Alice Lohrman Andrews Research Professor in Hepatology, was honored by the American Gastroenterological Association, or AGA, for her pioneering work in liver diseases. She earned the AGA’s 2016 William Beaumont Prize in Gastroenterology, which recognizes an individual who has made a unique, outstanding contribution of major importance to the field. Lok is also the assistant dean for clinical research and a professor of internal medicine. Costas Lyssiotis, Ph.D., assistant professor of molecular and integrative physiology and of internal medicine, and Sriram Venneti, M.D., Ph.D., assistant professor of pathology, were selected to be Sidney Kimmel Foundation scholars. The Kimmel Scholar Awards were created to advance the careers of gifted, young scientists involved in cancer research. To qualify, grantees must demonstrate great promise and innovation in their work and be in the early stages of their research careers. Howard Markel (M.D. 1986), Ph.D, the George E. Wantz Distinguished Professor of the History of Medicine and director of the U-M Center for the History of Medicine, gave the 2016 commencement address at the University of Nevada at Reno. Markel was also a visiting professor of health sciences at the Ben-Gurion University in Beersheba, Israel, and the Gertner Insitute of Tel Aviv as part of their summer 2016 Visiting Leaders in Medicine program. Markel is also a professor of psychiatry, of public health, of history, of English literature and language, of pediatrics and communicable diseases, and of public health management and policy. Lena M. Napolitano, M.D., director of trauma and surgical critical care and the Joyce and Don Massey Family Foundation Professor of Surgery, was selected as master of critical care medicine by the American College of Critical Care Medicine. The title reflects leadership achievements of national and international influence and outstanding contributions in education and research that advance the field of critical care medicine. At the U-M, she is division chief of acute care surgery and associate chair of the Department of Surgery. Sanjay Saint, M.D., chief of medicine at the VA Ann Arbor Healthcare System, has been named the recipient of the Mark Wolcott Award for Excellence in Clinical Care Delivery by the Department of Veterans Affairs. This award is the highest honor for health care providers in the department. Saint is widely regarded as the international leader in the area of preventing catheter-associated urinary tract infection, one of the world’s most common health care-associated infections. Saint is also the George Dock Professor of Internal Medicine at U-M, where he serves as senior associate chair of the Department of Internal Medicine. Sally Santen, M.D., Ph.D., was awarded the Society for Academic Emergency Medicine, or SAEM, Hal Jayne Excellence in Education Award, which recognizes “an SAEM member who has made outstanding contributions to emergency medicine through the teaching of others and the improvement of pedagogy.” Santen, professor of emergency medicine and of learning health sciences, leads curriculum development, student assessment and evaluation. She is also the associate chair for education in emergency medicine and assistant dean for educational research and quality improvement. 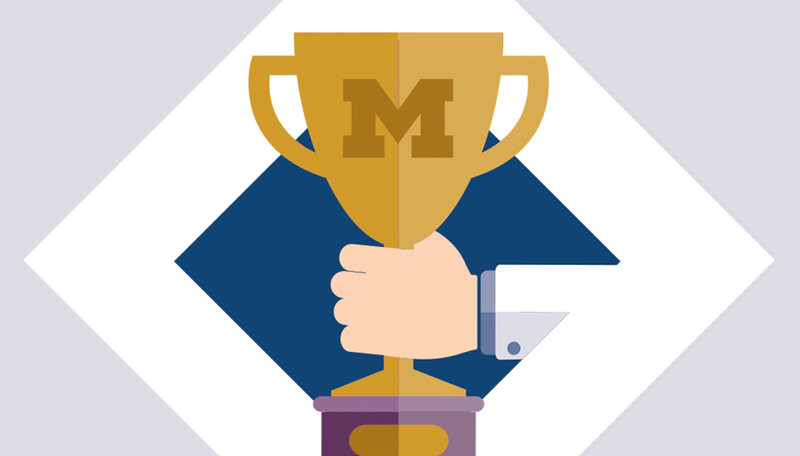 Endowed professorships are among the highest honors the U-M Medical School awards to our faculty. These professorships, often made possible by the generosity of private individuals and foundations, honor the groundbreaking work faculty pursue — in the name of education, patient care and research. View the list of professorships recently awarded.